Today it arrived! When I got home I immediately tried to set it up. The first part was really simple until I had to put the large cloth over the frame. That was mostly pretty hard because I forgot to open up the zipper completely and finally, with the help of Bart I was able to get it done in a bit over 20 minutes. The next time will be faster and so will the next. The total size is 100 x 100 x 200 cm. The material is really sturdy, big large zippers and LOTS of air holes and these are great! Probably I’m gonna cut a few open and cover them with red plastic to let in some non-harmful light. 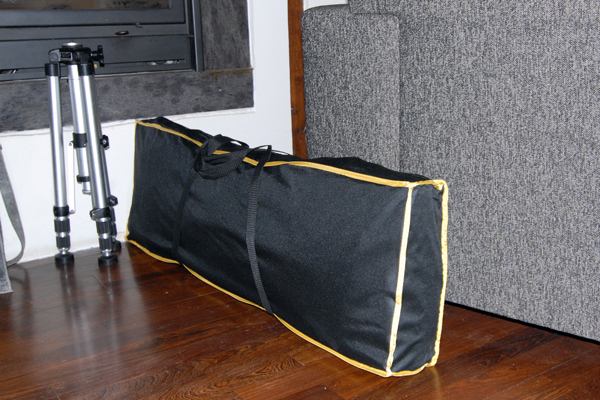 The bag, when folded, is pretty small and only about 12 Kg in total so very doable. Next: I have to get that table and I can try it out at our backyard! Unfolded it's really pretty big! This entry was posted on February 5, 2010 by Contrastique. It was filed under Wet Plate Collodion-Process & Chemistry . my only concern is the door. Still have to try it out in the real world. Was waiting for a couple of more items to arrive. The door works pretty fast though, the zipper is sturdy enough to deal with with one hand. I’ll have to try it out and will post impressions. Can you tell me how this worked? I was looking for an alternative darkroom for wet plate and I came across your site. I do not want a Nova as they are to expensive and this seems to be a really good idea. My fear is that as I live in the South of France and the light is very strong ( I want to use it only outside) and this will ruin the plates. Have your worked with this in bright direct sunlight? I love your pictures by the way, they inspire me to get my set up sorted. Many thanks for your help. I was not interested in the Nova either because you need power to inflate the thing. And 530 pounds is really expensive! I only use the tent when working outdoors or when giving a demo and there’s no darkroom on location. I have used it in bright direct sunlight a lot and it works perfectly. The tent is absolute light tight. There are a few light spots where the stitching is. Can easily be solved by sticking black tape over them but I’ve never bothered to do so as that is soooo little light, and the collodion being not all that sensitive I’ve never had any light leak issues. When you go out to work and it’s hot outside..the tent is black so the temperature will rise. To keep that from rising to annoying levels you can cover the top of the tent with a white cloth to reflect the light thus the heat. I have tried to flip the tent inside-out because the inside is silver but that puts so much strain on the stitches I didn’t dare leaving it like that for too long. Also the zipper of the tent is on the outside. You can zip it down from the inside but not completely. 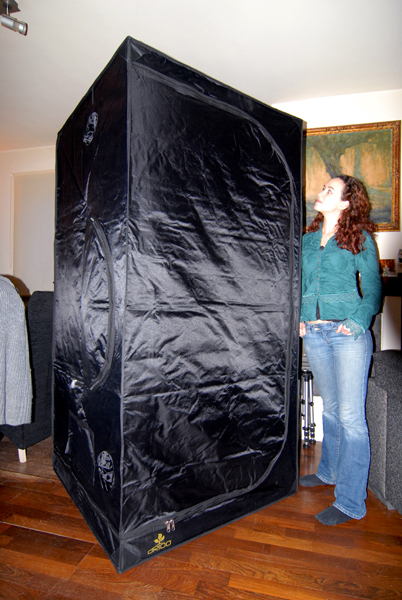 You can cover up that last part using a black cloth which will keep the light from getting in there. As for the rest, the tent works really perfectly! Easy to set up, you have handy compartments in there to attach red LED lights with battery which work as a nice safe light. It’s pretty light with its 12 kilos and comes in a handy bag so you can carry it around just fine. The south of France, I’d love to make Collodion plates over there! France is very beautiful! Where exactly are you located there? Provence or Languedoc? Anyway, if you have some more questions feel free to shoot! I hope to get out there myself today but the weather is a bit tricky..
P.s, you have some awesome hotel-photographs! Stunning places. Many thanks for that. I am going to buy one now. We are in the Languedoc between Nimes and Montpellier. We have a large house and will soon have a portable darkroom so if you are in the area and need a bed and some collodion drop me a line, you will find all of my details on my site. Many thanks. Ow nice and I certainly will! Good luck with the tent, hope it’ll work out for you as well as did for me! i learned a fantastic trick for my mobile darkroom. i also have the 4×8 secret gardin darkroom but here in LA it gets super hot so we turned it inside out so the silver is outside and it is WAY cooler, and also feels a lot darker inside. I tried that with mine too some time ago but wasn’t too keen on the strain it put on the seams. Haven’t tried it since. Great to see it works for you. Might give it another go this summer as I would prefer the silver outside to keep the heat out.